DC continues to set standards for excellence in E&P B2B publishing to fulfill our mission as definitive media in the drilling space. In the pages that follow, you will learn how DC has built upon its proud 75-year history to break ground in exciting ways. MISSION: DC is the definitive source for the global drilling and completion industry, both land and offshore, and the only viable magazine exclusively covering this space. DC’s enhanced editorial employs QR codes to help readers find related multimedia and other resources. The official magazine of the International Association of Drilling Contractors, DC has been published since 1944 and is the longest continuously published magazine focusing on drilling and completion (D&C). EDITORIAL: DC’s editorial is 100 percent drilling and completion focused – technology, markets, HSEQ, trends and other critical issues impacting D&C. DC is the only E&P magazine to write about HSE, training and competency in every issue. DC is also the only magazine covering completions in every issue. 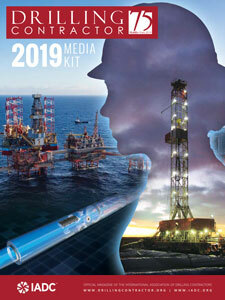 And of course, every issue features drilling technology and trends. 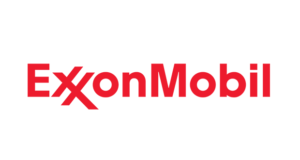 READERSHIP: DC’s 31,000-plus readers are professionals in the oil-and-gas and geothermal drilling and completion industry and include senior management at exploration & production and drilling contractor companies. DC also offers the largest circulation available among drilling contractors (nearly 12,000). Further details on DC’s circulation are available on the circulation page. Mission driven as the definitive B2B source for drilling and completions globally, land and offshore. Print editorial enhanced with online original multimedia. DRILLING AHEAD: Opinion column giving insights into the D&C industry. 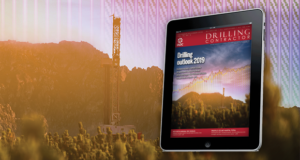 D&C NEWS: Presents the latest news in the drilling and completion industry – drilling contracts, field development, hydrocarbon discoveries and more. D&C TECH DIGEST: Concise summaries of timely drilling and completion technical achievements and milestones. HSE&T CORNER: Trends and practical advice in training, competency, health, safety, the environment for the wells industry. PERSPECTIVES: Profiles of men and women who stand tall in the D&C business. IADC CONNECTION: Focus on IADC news, initiatives and opinions. 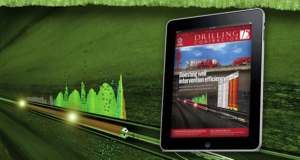 The perfect complement to print DC, featuring great original content and the most original multimedia in E&P B2B. READERSHIP: More than 18,000 unique visitors per month and climbing! Total ad clicks average more than 2,990 per month with the overall clickthrough-rate over 1.5% for 2017. Original reporting with emphasis on multimedia 12times per year, linking to www.DrillingContractor.org. MISSION: Driven by original reporting from key industry events and on the latest industry news and technology updates. 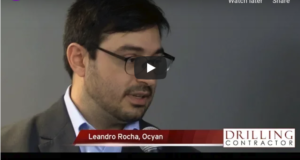 Innovative use of video and multimedia distinguish eNews from the herd. READERSHIP: 16,700 subscribers and growing, up from 8,000 in mid-2012. With impressions upwards of 17,000 from the September 2018, eNews boasts a strong 0.15% click-through rate. Succinct monthly e-letter focused on IADC initiatives, news and governmental actions affecting drilling. MISSION: IADC champions better legislation and regulation for well delivery, and the monthly e-letter Drill Bits addresses this complex regulatory world. DB’s mission is reporting the myriad activities of IADC, along with updates on legislation, regulation and standards affecting your business. READERSHIP: Drill Bits reaches some 15,000 subscribers monthly with its unique menu of short, punchy regulatory updates. Official site of IADC, and one of the early web pioneers for the E&P industry. 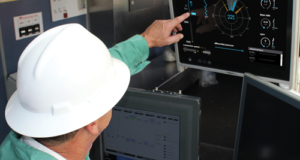 Major focus on catalyzing improved performance in wells delivery. MISSION: Provide the best information and resources to catalyze improved performance in drilling by enhancing operational integrity and championing better regulation and legislations. Internet marketers can efficiently target the global drilling industry through select pages on this key website – IADC.org, official site of the International Association of Drilling Contractors. READERSHIP: IADC.org was one of the first websites in the E&P industry, founded in 1995, and enjoys traffic of more than 29,000 visitors per month, with more than 100,000 page views and a high click-through-rate (0.78% CTR). MISSION: Enhancing operational integrity is a key objective of IADC. Drilling personnel depend on IADC’s unique checklists, safety meeting forms and the IADC Drilling Manual, the definitive drilling operations guide, to assist them through critical operations. Bring your message right to the rig floor through IADC’s unique offerings. IADC DRILLING MANUAL: A sweeping rewrite of this definitive operational guide is well under way. Sponsorships are available for each of the approximately two dozen chapters to be included. IADC DAILY DRILLING REPORT: One of IADC’s biggest sellers, the IADC DDR is the leading rig-site data-collection tool. 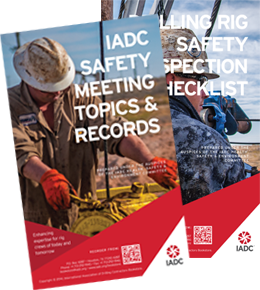 IADC DRILLING RIG SAFETY INSPECTION CHECKLIST: A comprehensive guide to key hazards, the rig checklist was recently updated and redesigned. IADC SAFETY MEETING TOPIC AND RECORD BOOK: Every rig shift (“tour”) kicks off with a safety meeting, which explains the popularity of this venerable resource. IADC WEEKLY SAFETY MEETING REPORT: Crews choose their own topics using this convenient form. IADC DAILY ENGINE REPORT: This newly revised form is essential to rig personnel to record critical engine pressures and temperatures. IADC MUD PUMP INSPECTION CHECKLIST: Maintaining high fluid throughput is essential in many of today’s difficult wells. 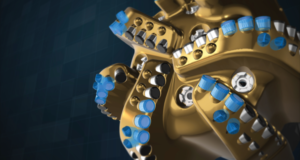 This new form is one that goes to the heart of today’s drilling challenges. IADC NEAR-MISS REPORT: Reducing near-misses is the next big push in wells safety. This new form, supported by several major international operators, is a huge step forward in wells HSE. 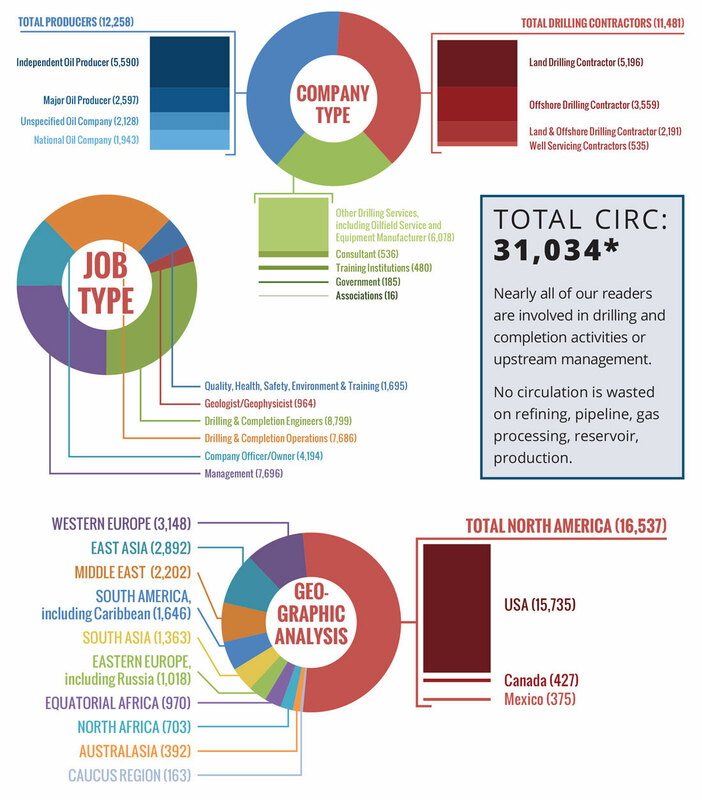 The definitive guide to the players in the global drilling industry. MISSION:The IADC Membership Directory details IADC members worldwide, rig statistics and locations, IADC officers and staff, highlights of new programs and more. 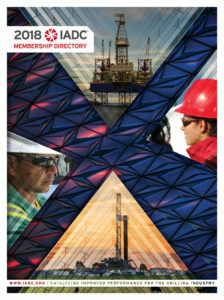 The IADC Membership Directory is the definitive guide to the global drilling industry and your opportunity to connect with the global wellsite industry – rig owners both land and offshore and the oil companies they serve. READERSHIP: The IADC Membership Directory is your opportunity to connect with the global wells industry. With more than 5,000 recipients, the IADC Membership Directory has matured into an indispensable global reference of key operators, contractors, drilling rigs, suppliers and services for the full year of its useful life. SPECIAL READERSHIP SURVEY! How many readers read and remembered your ad? Find out with our bonus reader survey. Select ads only. Contact sales rep for details. * “Innovating While Drilling® (IWD)” is a trademark of the International Association of Drilling Contractors and Drilling Contractor. DC is distributed at over 19 high-interest conferences worldwide. INSERTS/SPECIALTIES: Bound-in, tabbed, CDs – contact publisher. Details available upon request. ALL PRICES IN US DOLLARS: Frequency rates are based on the number of insertions used within a 12-month period (whether ROB, special position, covers, etc). Each page or fraction qualifies as one insertion. Spreads count as 2 insertions. RATE PROTECTIVE CLAUSE: When new rates are announced, contract advertisers will be protected at their contract rates for the duration of their contract. Contracts made prior to the effective date of the new rates will also be protected at the then-existing rates. AGENCY COMMISSION: 15% commission to recognized agencies on gross billing for space, color, cover or special position, and insert charges. No commission on miscellaneous charges or for classifieds. CASH DISCOUNT: 2% net after agency commission, if paid within 15 days from date of invoice. Advertisers and advertising agencies assume liability for all content and illustrations printed and assume responsibility for any claims arising therefrom against the publisher. Publisher reserves the right to reject any advertising which he feels is not in keeping with the publication’s standards and to prominently place the word “advertisement” with copy that closely resembles editorial material. Publisher will repeat latest advertisement for scheduled space when no new acceptable copy is furnished. Cancellations accepted only before closing date for reservations. Publisher reserves the right to require payment in advance. PREFERRED MATERIALS: Digital artwork can be supplied in most platforms, preferably high-resolution PDF, Adobe InDesign CC (INDD), Adobe Illustrator CC (AI/EPS), or Photoshop CC (EPS/TIF). Please ensure colors are CMYK (PMS spot colors should be converted to process). All fonts should either be included or converted to outlines. ADOBE INDESIGN CC – preflight to ensure colors are CMYK (PMS spot colors should be converted to process) and use package function to copy all fonts and images. ADOBE ILLUSTRATOR CC – save graphics in EPS format with fonts outlined. Set document color mode to CMYK (PMS spot colors should be converted to process). ADOBE PHOTOSHOP CC – save as EPS or TIF files in CMYK format with a preview of 8 bits/pixel and binary encoding. 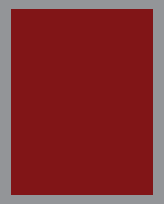 Minimum resolution must be 254 pixels/inch (100 pixels/cm). JOIN THE LEADERS OF THE GLOBAL DRILLING INDUSTRY. ADVERTISE IN THE 2019 IADC MEMBERSHIP DIRECTORY! MISSION: The 2019 IADC Membership Directory is the definitive guide to the global drilling industry and your opportunity to connect with the global wellsite industry – rig owners both land and offshore and the oil companies they serve. 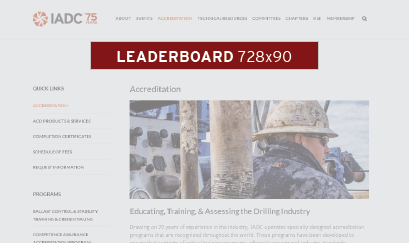 READERSHIP: IADC, the International Association of Drilling Contractors, is the only industry trade association with international scope among drilling contractors, oil companies and service firms alike. Accordingly, the 2019 IADC Membership Directory has matured into an indispensable global reference of key operators, contractors, drilling rigs, suppliers and services for the full year of its useful life. The IADC Membership Directory puts your marketing message in the hands of 5,000 drilling and producing executives. If you do business with the worldwide rig fleet, the 2019 IADC Membership Directory is an outstanding advertising value. It is also an excellent way to highlight your company’s support for IADC’s initiatives in government affairs, HSE, well control, technology and more. The IADC Membership Directory will be published in April and enjoy bonus distribution at the 2019 Offshore Technology Conference, 6-9 May in Houston. 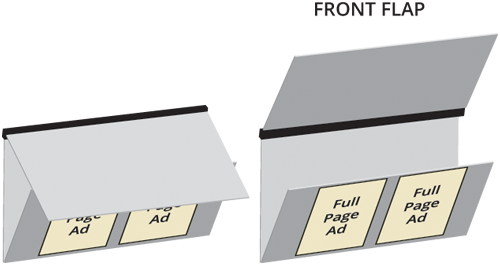 Tabbed Section dividers boost ad visibility economically. Increase the visibility of your firm’s advertisement this year in the 2019 Directory by reserving a tabbed section divider. Each of the Directory’s major sections will be introduced by a tabbed, heavy-stock divider. Hurry! Spots are limited! 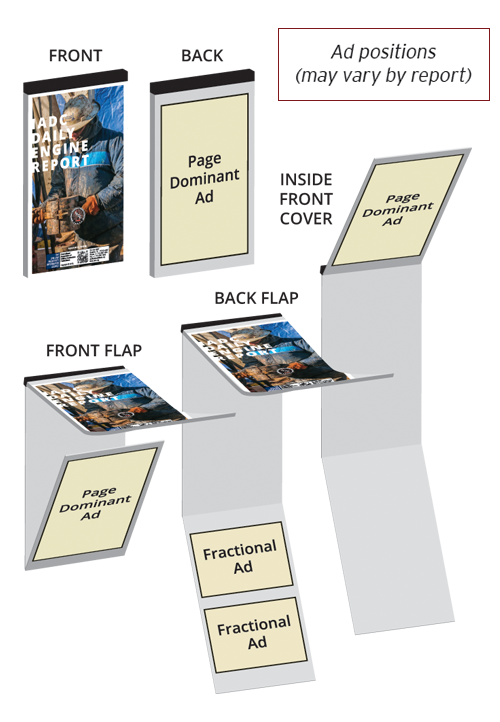 Right of first refusal applies to divider-page advertisers in the 2018 IADC Directory. MECHANICAL REQUIREMENTS: Ad sizes and other mechanical requirements are identical to those of Drilling Contractor. 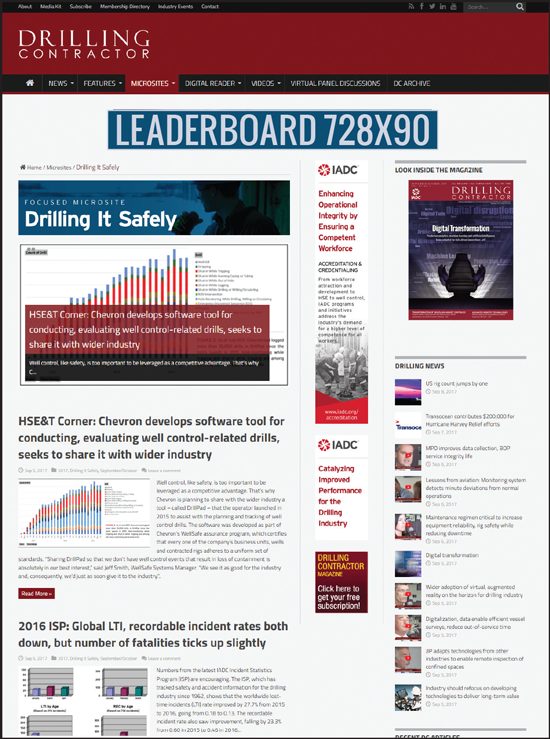 DRILLINGCONTRACTOR.ORG is a source of breaking news for the drilling industry, as well as a unique companion to the print edition of Drilling Contractor. 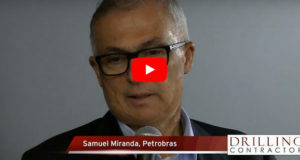 DrillingContractor.org reports via text and video alike on the latest news affecting and shaping the global drilling and completions industry. DrillingContractor.org is set apart by its unique enhanced online editorial complementing DC’s respected print version. Examples of web exclusives include animations and videos related to articles published in DC, as well as additional graphics, editorial and case histories. 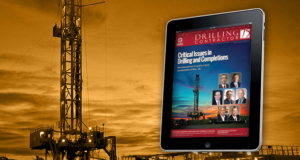 Each article featuring enhanced editorial includes a footnote directing readers to check out the additional material on DrillingContractor.org. DrillingContractor.org also maintains thorough archives of past issues. SOCIAL MEDIA: Different companies use social media in different ways, but our primary goal is simple: drive users back to our site. Our secondary goal is to take advantage of the engaging nature of social media outlets to extend our web presence. Each piece of great content we produce has the potential to go viral in any number of our social media platforms, which will lead to more impressions for DrillingContractor.org and will also increase ad clicks. PREFERRED MATERIALS: Artwork can be supplied as JPG, PNG, or Animated GIF. For Double-click and other third-party ad support, please contact the publisher for more information. Please note: Ads rendered in Shockwave Flash format will not be visible on iOS platforms and are more commonly being blocked (by default) by numerous web browsers. In light of these developments, we no longer accept files in SWF format. DrillingContractor.org offers highly specialized microsites to help you carefully hone your marketing message. Each of our standing microsites focuses on a specific area of interest within the well-construction sector, from HSE to global markets. • No rotating ads on landing pages! • Your ad will show on all articles linked to any microsite! DC microsite advertisers dominate their respective microsite landing pages as the sole advertiser – no rotating ads on landing pages! That’s right! If you advertise on any microsite, your ad will show on ALL ARTICLES LINKED TO ANY MICROSITE! Example: Advertise on the Onshore Advances microsite. Your ad appears on all landing pages for Onshore Advances. Your ad will also appear on ALL ARTICLES linked to any of the eight microsites. Content includes our great topical articles from DC, as well as original editorial and multimedia. DRILLING RIGS & AUTOMATION: covering cutting-edge advances in automation, rig equipment and design, control systems, maintenance, cybersecurity and condition monitoring, and other topics. 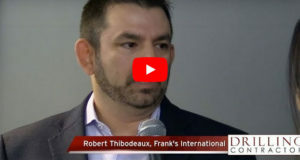 INNOVATING WHILE DRILLING® (IWD)*: addressing key downhole advances, including underbalanced and managed pressure drilling; rotary steerable systems; MWD, LWD, SWD; directional drilling; geosteering; bits; drilling and completion fluids; slim-hole well designs, coiled tubing and much more. 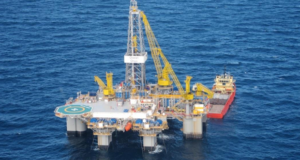 THE OFFSHORE FRONTIER: looking at exciting developments in marine drilling and completions. DC will also periodically develop ad hoc microsites, for example, for IADC conferences and other events, such as OTC. DC virtual panel discussions are one of the greatest values available to drilling and completion marketers. These high-interest webcasts feature expert panelists on the critical issues confronting the well-construction industry. Each of the pre-recorded VPDs will span 30 minutes to an hour. Virtual panel discussions will be posted on DrillingContractor.org for a full year following initial airing. DC VPDs differ from typical webinars because they blend video, shot in DC’s in-house studio, with PowerPoint and additional videos or animations. Each VPD is promoted multiple times through combinations of DC, eNews dedicated promotions, reaching more than 20,000 drilling and completion professionals. In addition, pre- and post-VPD reminders are sent to all registrants the day before and after the webcast, respectively. All promotions for the VPD, whether print or electronic, will prominently feature the sponsor logo. In addition, the sponsor will be thanked at the start and finish of the VPD and the sponsor logo displayed on the video. Further, each VPD will be promoted with a special marketing box in scheduled issues of eNews from DrillingContractor.org, as well as dedicated eblasts, as outlined in the table to the right. Sponsors will also receive names and contact information of all VPD registrants. Our virtual panel discussions provide significant added value, as the table on the right shows. Likewise, all DC virtual panel discussions must be deemed as value adding to readers and viewers. Excessive commerciality tends to discourage viewers and diminishes credibility. *NOTE: Since DC does not sell lists or offer third-party eblasts, this is the only mechanism for a single company to eblast the DC readership. **Pre-event reminder sent to registrants one day prior to VPD, and post-event wrap up email to registrants the following day. The reader’s handy booklet format allows readers to easily flip through pages on their computer desktop, tablet or smart phone. DC’s digital reader can be viewed on an iPad, Android tablet, Windows or Mac OSX computer. SPONSOR THE DC DIGITAL EDITION! * Sponsor logo included on blast announcing publication of the digital edition. Sponsor receives 2500 x 60 and 300 x 250 banner on the digital edition masthead and to the left of digital cover, respectively. 2500 x 60 banner placed above Digital Reader will be visible from all pages (not visible if reader zooms to enlarge page). Internet marketers can now target the global drilling industry through selected pages on its leading website – www.IADC.org, official site of the International Association of Drilling Contractors. IADC.org was one of the first websites in the E&P industry, founded in 1995, and enjoys traffic of more than 29,000 visitors per month (roughly 81% of those being new sessions) with more than 100,000 page views. HSE: Links to IADC Safety Alerts, IADC Incident Statistics Program (Introduction), IADC HSE Case Guidelines. * ADVERTISING IS UNAVAILABLE ON THE IADC.ORG HOME PAGE AND THE IADC EVENTS PAGE, ALONG WITH INDIVIDUAL EVENTS (WWW.IADC.ORG/EVENTS AND LINKED PAGES). ** ADVERTISING WITHIN THESE PUBLICATIONS IS NOT INCLUDED. Don’t miss out on this opportunity to build your brand among the next generation of industry leaders and employees! IADC has opened its Lexicon website, launched in 2014, to advertisers. 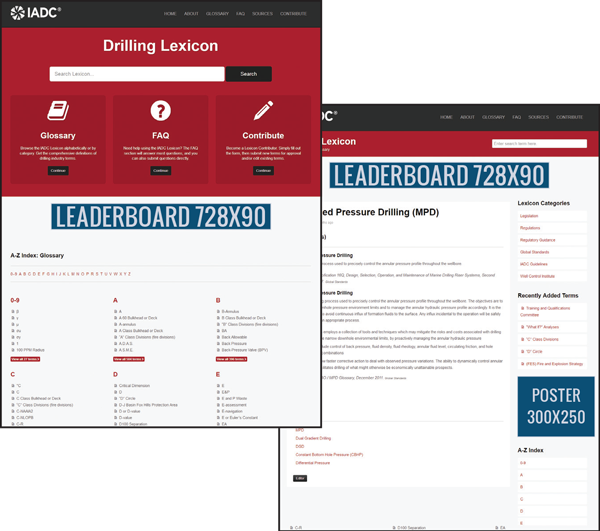 The IADC Lexicon is a glossary of oilfield drilling terms that have been defined in legislation, regulations, standards and/or guidelines. Over the past year, the website has logged more than 270,000 sessions. Impressively, data analytics show that the largest bloc of Lexicon users belong to the coveted age group of 25-34. The next-largest bloc of users (25%) are between the ages of 18-24. The IADC Lexicon is a prime opportunity for marketers in the drilling industry — get in early as ad spots are limited! WHAT CAN ADVERTISERS GET? Advertise across every inside page with a poster ad, or site-wide with a leaderboard (includes the homepage). With either spot, your ad will be featured on every definition page throughout the site (that’s over 10,000 terms!). Your advert will rotate with other leaderboard or poster ads (2-5). eNEWS FROM DRILLINGCONTRACTOR.ORG is DC’s electronic tool to communicate with the drilling & completion industry. 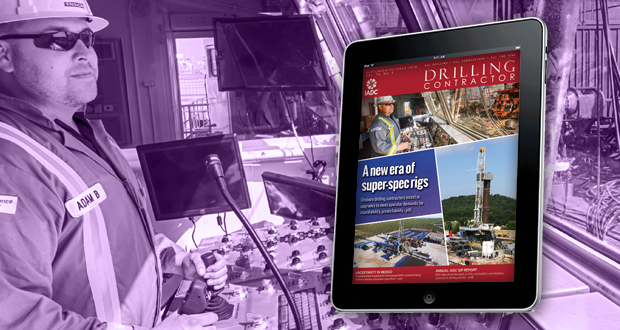 DC is published in print format six times per year, and eNews from DrillingContractor.org ensures that our readers receive up-to-date information 12 times per year. eNEWS presents original news and features, as well as information from key industry players, updates on IADC activities, exclusive reports from IADC conferences, reader surveys and more. Each edition of eNews links back to DrillingContractor.org. FREQUENCY DISCOUNTS follow the same program as for DrillingContractor.org. Placements in eNews count as DrillingContractor.org placements, and vice versa. 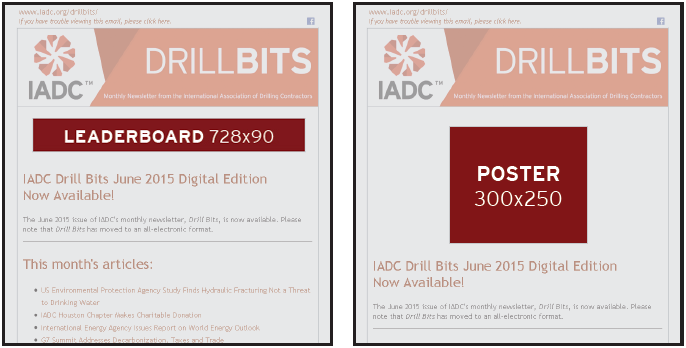 Drill Bits is IADC’s major vehicle for communicating about pending legislation and regulation impacting the global drilling community. IADC’s electronic newsletter Drill Bits reaches 15,000 readers monthly, keeping them abreast of the latest news that can affect their business. In addition, Drill Bits highlights IADC initiatives, new IADC members, safety milestones, newly accredited training providers and more. Reach your target technical drilling engineering and operations audience by sponsoring a chapter of the IADC Drilling Manual, the definitive rig operations guide. 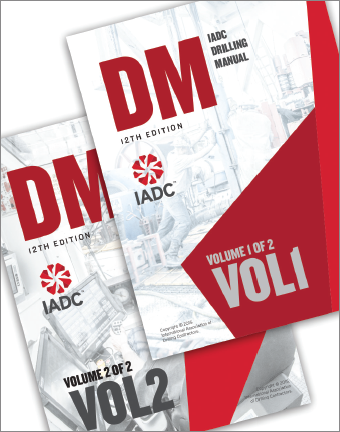 Released as electronic books during 2014 and printed in early 2015, the new edition of the IADC Drilling Manual represents the first major upgrade of this respected reference since 1992. All chapter sponsorships are exclusive! Sponsors can place a full-page, four-color advert on the chapter’s inside front cover. Sponsorships are good for six months in the electronic chapter (eChapter), and for the first 1,000 copies of the print version. Hurry! Many chapters are already sold out. All prices are net USD. And the potential distribution reach of these chapters has expanded to include a market of 600,000 professionals. This is through our new venture with Techstreet (part of Thomson Reuters, the world’s leading source of intelligent information for business and professionals), whose customer base exceeds half a million. REACH THE RIG WITH YOUR MESSAGE! Have a message you want to bring straight to the rig? 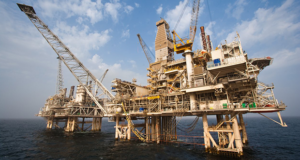 Marketing your company’s products and services through IADC checklists and forms provides in-your-face presence at the rig site and before rig-based operational specialists. IADC DAILY DRILLING REPORT: The IADC Daily Drilling Report is the primary data-collection form for hundreds of rigs around the world. Also called the “tour sheet,” the DDR captures pressure information, depth, payroll information and much more. IADC DRILLING RIG SAFETY INSPECTION CHECKLIST: The definitive checklist for rig safety inspection is indispensable at the rig site as a comprehensive guide to key hazards. The checklist was recently updated and redesigned. Older versions will need replacement, making this checklist a hot seller. Printed on carbonless paper to provide multiple records. Adverts available on the back cover, and on both the front and reverse flap. The flap stands out, due to its purpose in separating pages to avoid overwriting future pages. 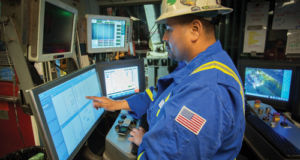 IADC SAFETY MEETING TOPIC AND RECORD BOOK: Safety meetings on the rig are more important than ever, and the IADC Safety Meeting Topic and Record Book are a rig crew’s guide to vital HSE topics. Significant revisions were incorporated into this popular form to highlight important safety topics in today’s complex drilling industry. Further, the form was reorganized to improve the flow of topics in this popular form. Printed on carbonless paper for multiple copies. IADC WEEKLY SAFETY MEETING REPORT: Crews can choose their own topics for discussion using this convenient and fast-selling form, printed on carbonless paper for multiple copies. IADC DAILY ENGINE REPORT: The newly revised IADC Daily Engine Report is an essential record of drilling engine temperature and pressures. Among the functional improvements is space for measurements of additional mud pumps and multiple record sheets on carbonless paper. IADC NEAR-MISS REPORTS: Reducing near misses is the next big push in wells safety. This new form, supported by several major international operators, is a huge step forward in wells HSE. Two versions! One for Drilling, one for Well Servicing/Workover! 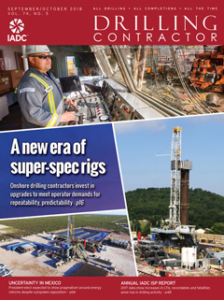 Drilling Contractor is the official magazine of the International Association of Drilling Contractors (IADC) and is wholly owned by IADC, which is also the publisher of the annual IADC Membership Directory.